Sometimes the best strategy for managing pests is to eat them. Cajuns savor stewed nutria. Mexicans crunch fried grasshoppers. The French swallow butter-soaked snails. And I have started eating bamboo. After beautifully screening my bee and compost yard for fifteen years, my bamboo hedge is getting out of hand, pushing up shoots as far as 10 feet from its designated territory and right through the heavy-duty landscape fabric at the base of my raised beds. 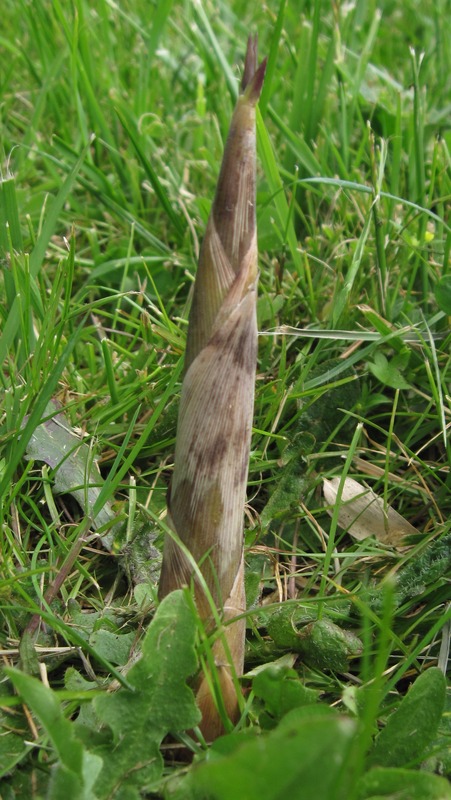 The shoots can grow as much as a foot in a day. Why was I fool enough to plant running bamboo without walling it in? Actually, I have no regrets about this, most of the time. The 25-foot-long hedge not only looks lovely all year around; it also provides all the stakes and trellis material that I and my friends can use, and on summer afternoons it shades one of my beds so I can grow lettuce there. I don’t know what species of bamboo I have; the nursery sold it simply as “green bamboo.” According to the American Bamboo Society, there are about 1,450 species of bamboo, many of them native to Asia but others to Australia, Africa, or North or South America. Most if not all species have edible shoots. 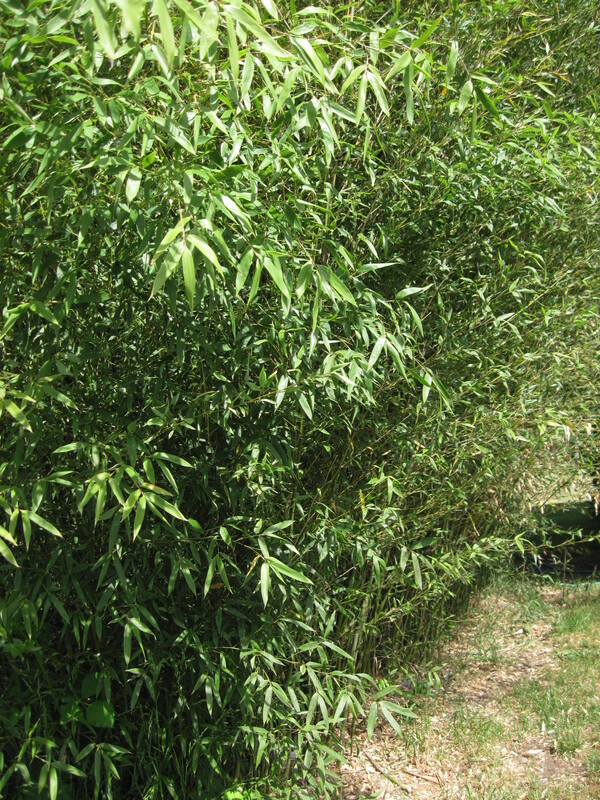 My bamboo grows about 15 feet high, and the canes are no more than about an inch in diameter. Because bamboo species vary so much, it’s hard to find reliable advice about harvesting and preparing the shoots. Some people say to cut them a few inches below the soil surface as soon as they emerge from the ground. Others say to let them grow to as high as a foot. Some say what matters is time, not height, because the shoots grow tough and bitter when they are exposed to the sun for too long. I decided to harvest mine when they were no taller than 6 inches; many were only 2 to 3 inches tall. I dug with my hori-hori to break the shoots about an inch below the soil surface. In most cases I should have waited a day, or a few hours, anyway. 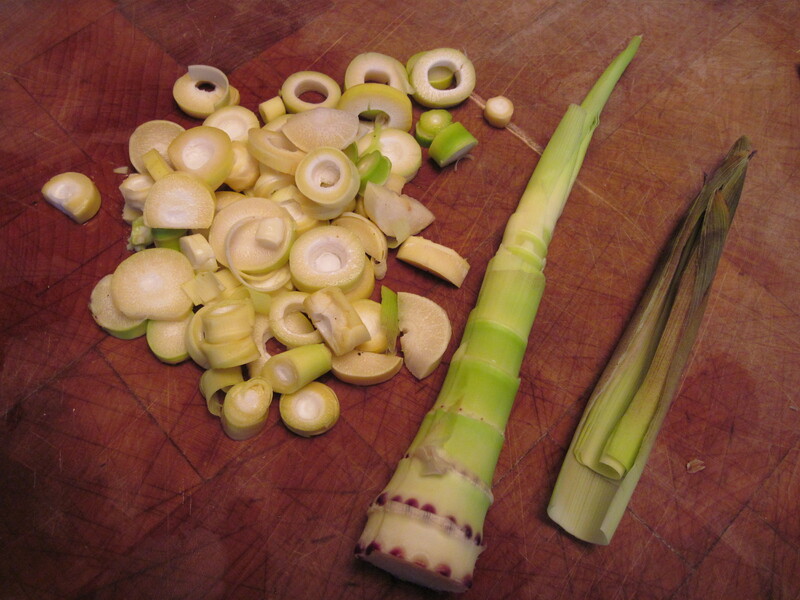 There is not much to eat in a 2-inch-tall, 1-inch-wide bamboo shoot, after you remove all the sheath leaves. Also too much bother were the skinniest shoots, ½ inch or less in diameter. I should have left those for the mower. All the bamboo experts seem to agree that bamboo shoots should be kept cool and cooked soon, so I collected mine over the course of just a week. I stored them in an unsealed plastic bag in the refrigerator. 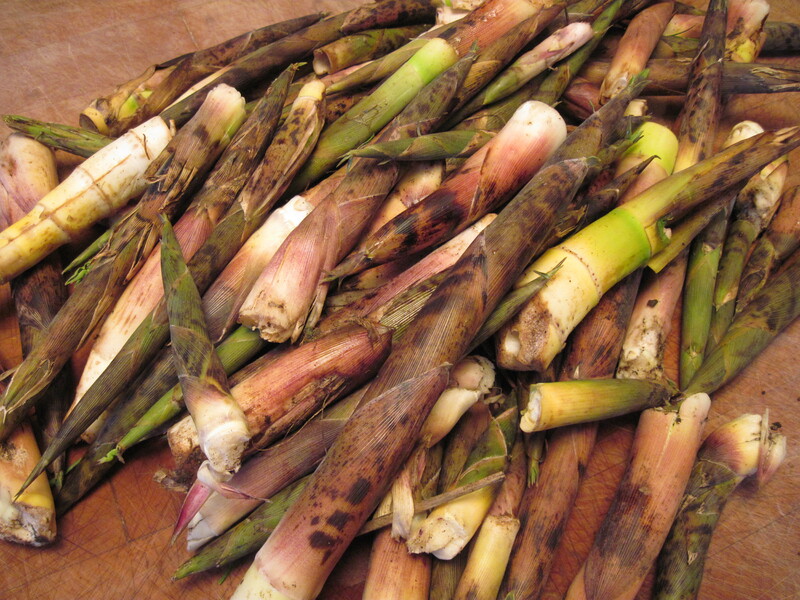 As I washed and trimmed and peeled the shoots, I tasted many of them. They had an unpleasant rawness about them, but none were bitter, not even the few I’d harvested at 10 inches tall. Later I cut some 12-inch shoots and licked their ends; they weren’t bitter, either. Next year I’ll follow advice from the self-published book Farming Bamboo: I’ll harvest the shoots at 6 to 12 inches, for a maximum of tasty flesh without bitterness. To make the shoots easy to peel, I scored them lengthwise, as you might an onion. I broke off the tips, which were all leaves without solid flesh, and trimmed off bottom ends that were damaged or very hard. Then, following instructions from Washington State University (WSU) Extension, I cut the shoots crosswise into 1/8-inch rounds, some of them hollow and some of them solid, and boiled them in an uncovered pan of water for 20 minutes. Leaving the pan uncovered is supposed to allow the compounds that cause bitterness to dissipate into the air (according to Farming Bamboo, tropical varieties are especially likely to have these compounds). If any bitter taste remains in the shoots, say all of my sources, boil them in fresh water for 5 minutes more. The initial 20 minutes’ cooking time was a compromise. Japanese writers call for as much as 90 minutes of boiling, always with rice bran added to remove bitterness, but in Japan cooks often boil their thick shoots whole. Farming Bamboo says that 10 minutes of boiling is enough, and that non-bitter shoots can be added raw to stir-fries. My cooked shoots weren’t at all bitter. They were still firm to the tooth, but they had lost their raw taste. Their delicate flavor reminded me of artichoke bottoms. How best to store cooked bamboo shoots? Japanese writers say to keep them covered with water in the refrigerator and to change the water every day; the shoots will keep this way for as long as a week. Farming Bamboo says that if you boil the shoots in lightly salted water, you can store them dry in a plastic bag or other container in the refrigerator. Again, I compromised, sort of: I’d boiled my shoots in unsalted water, but now I put them in a quart container and covered them with salted water (1 ½ teaspoons salt to 1 pint water). I figure I’ll change the water every two or three days, adding a little salt each time. Bamboo shoots can be frozen, too. If you slice and blanch them, says Farming Bamboo, you can store bamboo shoots in a sealed bag in a freezer for up to a year. They can go straight from the freezer into the wok. Besides providing a pleasant, mild flavor and an appealing crunch in salads and stir-fries, bamboo shoots are good for your health. They are low in calories, but they are high in potassium and fiber. 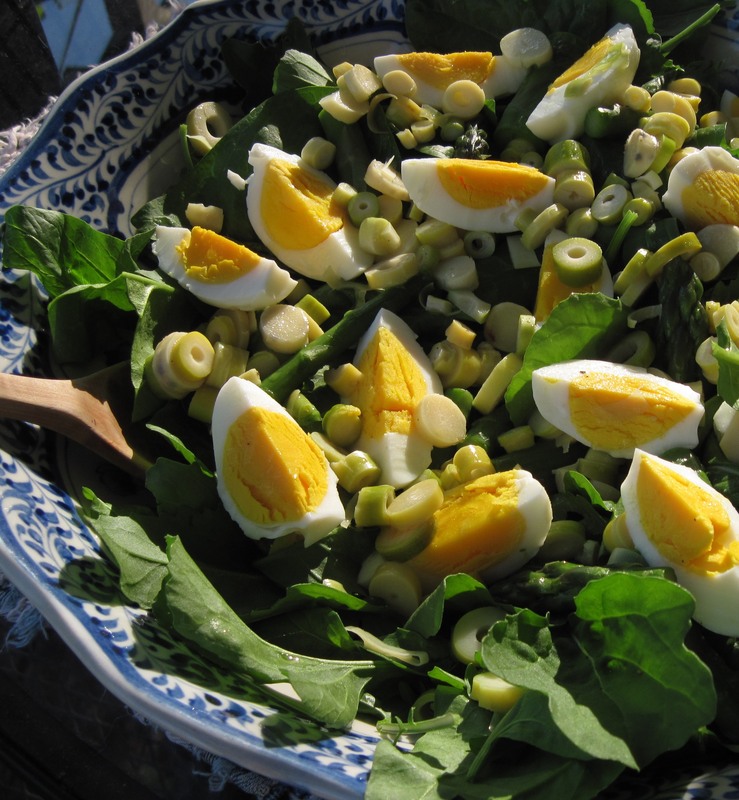 Last evening I briefly marinated two handfuls of bamboo shoots in a dressing of lemon juice and roasted hazelnut oil, and then I added the shoots to a salad of spinach, arugula, blanched asparagus, and sliced boiled eggs. A delicious way to celebrate springtime! Tonight I may add the shoots to a stir-fry, with broccoli and maybe some turnips. 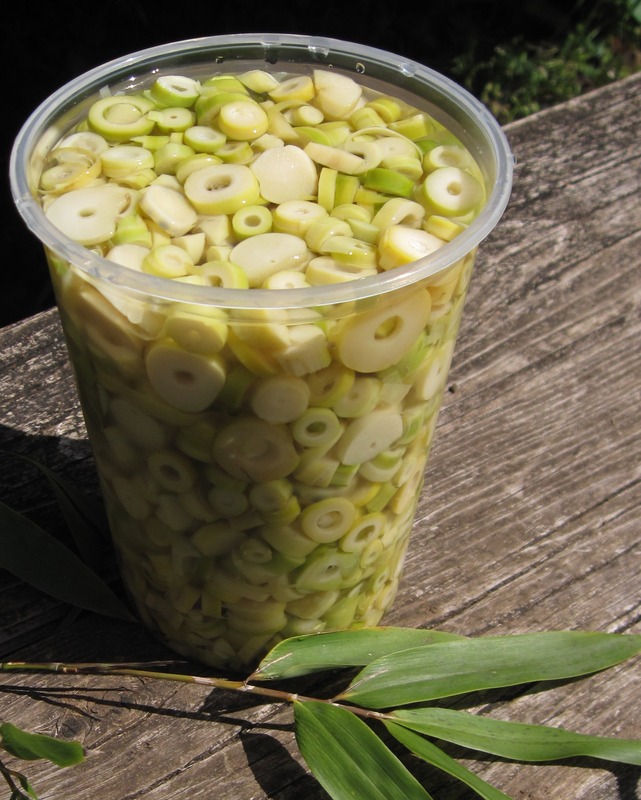 And, true to form, I’ll also have to pickle some bamboo shoots. Let me know if you have any suggestions. *A good source of information on other simple control measures (such as shallow trenching—I’ll try that next) and everything else about growing bamboo is the Bamboo Garden, a 20-acre Oregon nursery with 300 bamboo species for sale. This entry was posted in Vegetables and tagged bamboo, Bambusa, cooking bamboo shoots, freezing, Phyllostachys, preserving, storing. Bookmark the permalink. Nice! I need to find a local source of bamboo here. I had written on cooking with bamboo for NPR’s Kitchen Window: http://www.npr.org/2011/07/06/136394119/canned-wont-do-spring-brings-fresh-bamboo-shoots. Did you know about boiling it with rice bran (nuka) to neutralize the bitter (and poisonous) hydrocyanic acid toxin. I wrote about that practice. 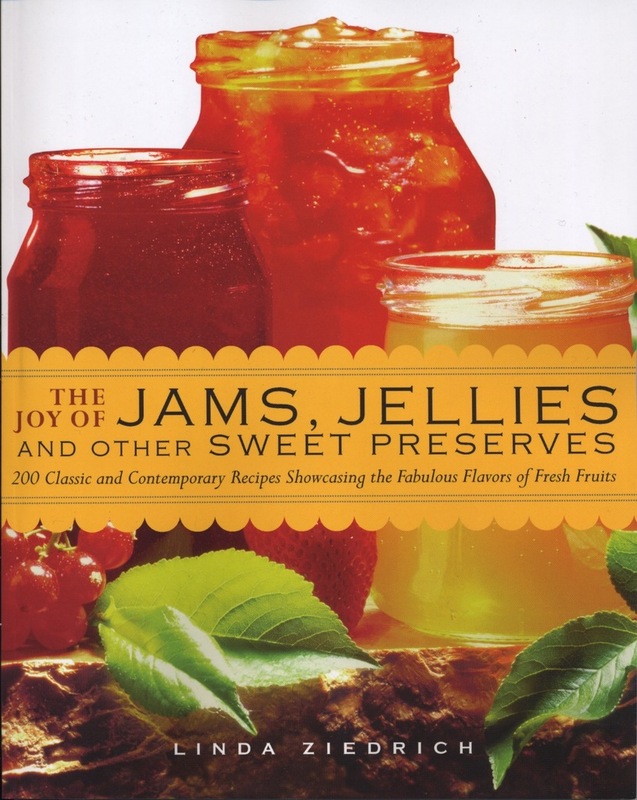 I know you’ve done nuka pickles before ala Japanese culinary maven Elizabeth Andoh, who I had interviewed for my article. That’s a lovely article, Laura! And I’m glad to learn that there’s a bamboo nursery near my home, in North Albany (www.bamboovalley.com). It seems to be standard practice in Japan to boil bamboo shoots with rice bran or water that rice was cooked in, and sometimes with chiles, to remove bitterness. This may indeed help, although cooks elsewhere say that boiling alone will work. Fortunately, there’s no need to worry about hydrocyanic acid if your bamboo has no bitterness. There seems to be a wealth of bamboo in our neighborhood. 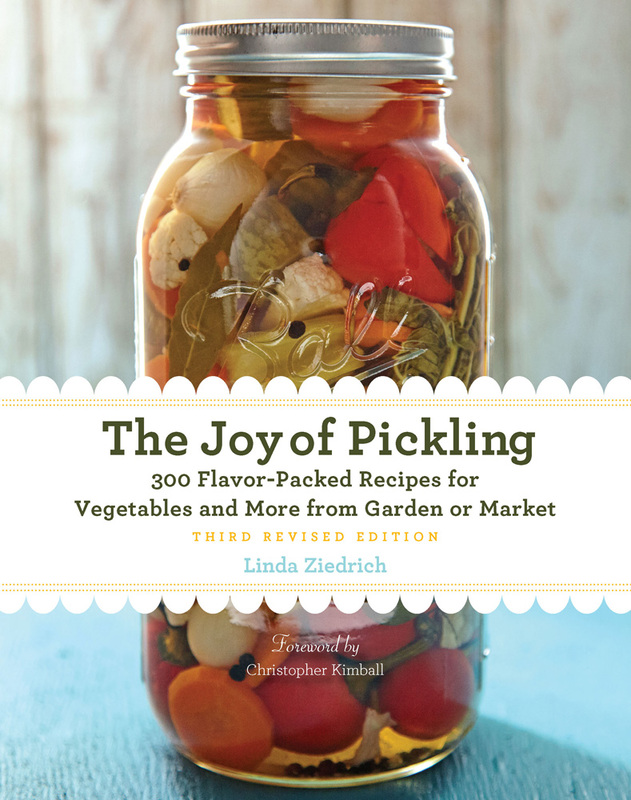 I’m curious to see how the pickling of it goes. Now that I might have to try.